According to a notification issued by the Union home ministry, the Governor of West Bengal, among all the Governors, will get the highest amount of Rs 1.81 crore as allowances for tour, hospitality, entertainment and other expenses. The West Bengal Governor will also be entitled to Rs 80 lakh as allowance for renewal of furnishings and Rs 72.06 lakh as allowance for the maintenance of the two Raj Bhavans, located in Kolkata and Darjeeling. The Tamil Nadu Governor will get Rs 1.66 crore as allowances for tour, hospitality, entertainment and other expenses. The Tamil Nadu Governor, which has Raj Bhavans in Chennai and Ooty, will also be entitled to Rs 7.50 lakh as allowance for renewal of furnishings and Rs 6.5 crore as allowance for the maintenance of the two Raj Bhavans, according to the notification issued last week. The salaries and allowances of the Governors are paid by the respective state governments. The Governor of Bihar will get Rs 1.62 crore as allowances for tour, hospitality, entertainment and other expenses. The Governor of Bihar will also be entitled to Rs 62 lakh as allowance for renewal of furnishings and Rs 80.2 lakh as allowance for the maintenance of the Raj Bhavan in Patna. The Maharashtra Governor will get Rs 1.14 crore as allowances for tour, hospitality, entertainment and other expenses, Rs 26.7 lakh as allowance for renewal of furnishings and Rs 1.8 crore as allowance for the maintenance of the three Raj Bhavans, located in Mumbai, Pune and Nagpur. The Governor of Karnataka will get Rs 1.05 crore as allowances for tour, hospitality, entertainment and other expenses, Rs 6.5 lakh as allowance for renewal of furnishings and Rs 38.2 lakh as allowance for the maintenance of the Raj Bhavan, located in Bengaluru. The Rajasthan Governor will be entitled to Rs 93 lakh as allowance for tour, hospitality, entertainment and other expenses, Rs 1 lakh for renewal of furnishings and Rs 73.2 lakh as allowance for the maintenance of the Raj Bhavans in Jaipur and Mount Abu. 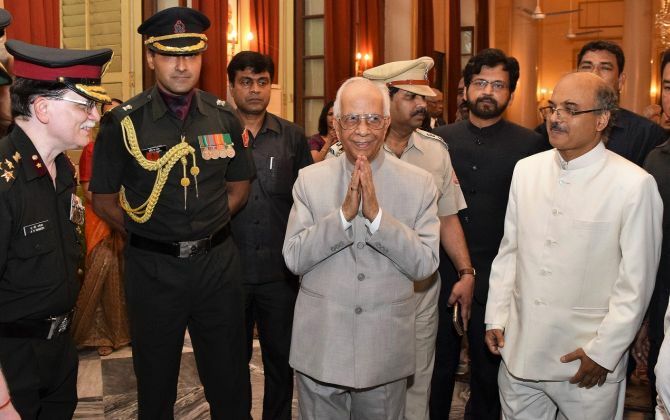 The Governor of Uttar Pradesh will be entitled to Rs 66 lakh as allowances for tour, hospitality, entertainment and other expenses, Rs 10 lakh as allowance for renewal of furnishings and Rs 3.53 crore as allowance for the maintenance of the Raj Bhavan in Lucknow. The Gujarat Governor is entitled to Rs 55 lakh as allowances for tour, hospitality, entertainment and other expenses, Rs 15 lakh as allowance for renewal of furnishings and Rs 20 lakh as allowance for the maintenance of the Raj Bhavan in Gandhinagar. The Governor of Haryana will be entitled to Rs 54.5 lakh as allowances for tour, hospitality, entertainment and other expenses, Rs 10 lakh as allowance for renewal of furnishings and Rs 21.6 lakh as allowance for the maintenance of the Raj Bhavan in Chandigarh. The Arunachal Pradesh Governor will be entitled to Rs 54 lakh as allowances for tour, hospitality, entertainment and other expenses, Rs 10 lakh as allowance for renewal of furnishings and Rs 30.75 lakh as allowance for the maintenance of the Raj Bhavan in Itanagar. The Governor of Andhra Pradesh will be entitled to Rs 53 lakh as allowances for tour, hospitality, entertainment and other expenses, Rs 6 lakh as allowance for renewal of furnishings and Rs 18.3 lakh as allowance for the maintenance of the Raj Bhavan in Hyderabad. The Madhya Pradesh Governor will be entitled to Rs 48.43 lakh as allowances for tour, hospitality, entertainment and other expenses, Rs 7.5 lakh as allowance for renewal of furnishings and Rs 25.12 lakh as allowance for the maintenance of two Raj Bhavans in Bhopal and Panchmarhi. The revision of allowances of the Governors came after four years. The salaries of the Governors were increased to Rs 3.5 lakh per month four months ago. Why is this man still a governor?